Burnley's James Tarkowski (left) and Wolverhampton Wanderers' Diogo Jota battle for the ball during the Premier League match at Molineux, Wolverhampton. PRESS ASSOCIATION Photo. Picture date: Sunday September 16, 2018. See PA story SOCCER Wolves. Photo credit should read: Nick Potts/PA Wire. RESTRICTIONS: EDITORIAL USE ONLY No use with unauthorised audio, video, data, fixture lists, club/league logos or "live" services. Online in-match use limited to 120 images, no video emulation. No use in betting, games or single club/league/player publications. The formula contributing to Burnley’s sticky start to the season isn’t exactly rocket science, says defender James Tarkowski. 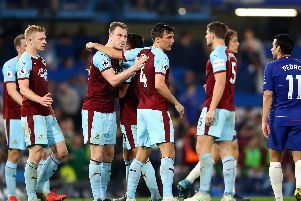 The England international simplified the Clarets’ woes so far in the Premier League, stating that they’re leaking too many goals and not scoring enough. Sean Dyche’s side have been unidentifiable up to now, conceding 76 shots in their last three games in the top flight, with 32 of those on target, and 103 shots against them in total. Following the 1-0 defeat to Wolves at Molineux, he said: “The simple fact of the matter is that we’re conceding goals and we’re not scoring them. “We need to start keeping more clean sheets and we need to start sticking the ball in the back of the net. The Clarets may be bottom of the pile at present but, just five games in, Tarkowski is refusing to over-analyse anything just yet. “It’s not a case of it being the last game of the season where we need a win or else we’re going down,” he said. “It’s not that desperate, but obviously we need to start getting points on the board. “We don’t want it to get to a stage where we’re getting towards the end of the season and we’re scrapping for points. “It’s still early so we’re not scrapping for points but we could do with getting some points on the board. We want to start working our way up the table and we need to pick our performances up. “We need to turn it around and we’re looking forward to the next game so we can try and do that.